Textura is a suite of construction management solutions designed to enhance collaboration and improve productivity. These construction management software solutions aim to improve project outcomes from the beginning until the end of the construction project cycle. Textura was founded on the idea that construction projects work best when there is collaboration among all participants, including owners/developers, architects, general contractors and subcontractors. This philosophy has been its guiding force in designing efficient solutions that encompasses all aspects of the project lifecycle. 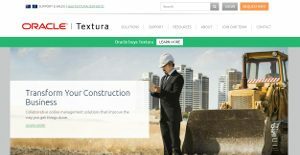 Today, more than 8,000 general contractors, owners/developers and architects, and over 500,000 subcontractors have used Textura across the entire construction project lifecycle and has been used to help manage 25,000+ commercial construction projects representing more than $270 billion in construction value. Textura provides a variety of solutions users would need in the lifecycle of the construction process. Even in the pre-construction stage, Textura offers a number of solutions, such as a solution that provides precise and accurate estimates for job costs, saving users time and effort. In addition, users can simplify, automate, and improve the construction prequalification process through its collaborative online system to effectively manage risk and find the best-quality bids. Textura also helps simplify bid management for users bidding out a project in a way that better partnerships are forged with the bidders. For users who would be bidding on projects, the platform also provides an enhanced bid management system that helps qualify, track, and win bids as well. Efficient document management, field management, and especially payment management is also possible through Textura’s solutions, allowing users to better control their construction project management work overall and promote better collaboration, information dissemination, as well as answer the other needs that may arise in the process. Textura also offers subcontractor and vendor performance evaluations that will help improve decision making and promote efficiency with tools to make the performance evaluations themselves easier and more effective, helping overall growth for all parties in the industry. If you are considering Textura it could also be a good idea to check out other subcategories of Best Construction Management Software collected in our base of SaaS software reviews. Each business is different, and may need a specific Construction Management Software solution that will be fit for their company size, type of customers and staff and even individual niche they cater to. It's not wise to count on locating a perfect services that is going to work for each company regardless of their background is. It may be a good idea to read a few Textura reviews first and even then you should remember what the service is intended to do for your company and your staff. Do you need a simple and intuitive app with just essential functions? Will you actually make use of the advanced functionalities needed by experts and large enterprises? Are there any particular features that are especially useful for the industry you work in? If you ask yourself these questions it is going to be much easier to locate a reliable software that will match your budget. How Much Does Textura Cost? We realize that when you make a decision to buy Construction Management Software it’s important not only to see how experts evaluate it in their reviews, but also to find out if the real people and companies that buy it are actually satisfied with the product. That’s why we’ve created our behavior-based Customer Satisfaction Algorithm™ that gathers customer reviews, comments and Textura reviews across a wide range of social media sites. The data is then presented in an easy to digest form showing how many people had positive and negative experience with Textura. With that information at hand you should be equipped to make an informed buying decision that you won’t regret. What are Textura pricing details? What integrations are available for Textura?